I got this recipe from Mamma’s street food restaurant just off of Soi Sam, Banglamphu, Bangkok. Mamma is a robust no nonsense Thai lady who cooks in a fiery wok on a busy street corner surrounded by at least 599 different ingredients. She makes the best Thai food for pennies and is a diva on the karaoke machine! 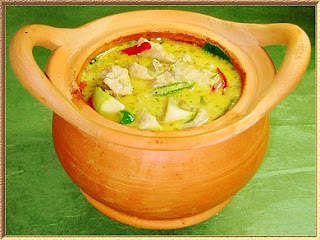 I learnt that it’s not only the ingredients that make a good green curry it’s the way you cook it. This dish doesn’t take long to cook on a high heat and it’s best to stir fry with a fast hand. Plan ahead and prepare everything in advance so you can cook up a storm just like Mamma. Firstly the tin of coconut cream needs to have been standing upright for a while so the thick coconut cream on top separates from the thin coconut milk below – do not shake the tin. Prepare the chicken and veggies seperatly, set aside. Mix the curry paste, sugar and fish sauce together and set aside. Heat the wok on a medium to high heat. Open the coconut cream tin and spoon as much of the thick cream as you can into the hot wok and leave. After a few minutes you will notice that the oil from the cream starts to boil, separate and the cream starts to brown, wait until you have a lot more oil than cream. Add the curry paste mix and quickly stir into the cream in the hot wok. Then add the chicken and stir fry until the chicken turns white. Add the rest of the contents from the coconut cream tin and the kafir lime leaf, bring to the boil. Add the vegetables, cook for 2 – 3 mins or until the chicken is cooked and vegetables are tender but crunchy. Garnish with the red chillies. This is as close to the authentic flavour of a Thai green curry as I’ve experienced at my dining table but let’s be honest, you really cannot beat the real thing. Travel Light to Thailand and experience some of the best cuisine on the planet or even take a Thai cooking class as part of your holiday. I chose this cook book because the recipes are traditional Thai and it is has been compiled by a Thai chef. Easy-to-follow, modern approach to traditional Thai cuisine with stunning photos of the Thai way of life. When I open the travel supplement of my preferred Sunday newspaper why do all the advertisements urge me to pack my bags and go to Phuket? or pay 5 nights and stay for 7 in Pataya? Surely there is more to see and do in Thailand than that? I know Thailand and I know what a fantastic holiday you can have there for a great price. I also know that Thailand consists of more than Phuket and Pataya and the last three couples I spoke to that have just come back from these idyllic paradise getaways say the same thing... "too crowded and over touristy". In fact as a travel agent I will always offer an alternative, Pran Buri for example, Koh Lanta or the quieter beaches of Samui. I have nothing against Phuket or Phi Phi but if you are looking for that genuine and tranquil Thai beach experience, you may be disappointed. I always offer the alternative but invariably clients have not heard of these gems and unless I have managed to persuade them otherwise, off to Phuket they go. How about spending a night with a Hill Tribe family or volunteering your services at an elephant sanctuary for a few days? Thailand has so much to offer but we hardly see it through the cheap uninspiring packages. The fact is that many operators know that these packages look good, sell well and easy profit is king. Of course this is important to any business, I know, but why not show some imagination in the packages advertised? You can have a great value holiday in Thailand and get a genuine experience at the same time. How about a 10 night package? For R16,500 including international flights and taxes? I think that is brilliant value. Remember for Travel Light value comes from your travel experiences not from the price. Some meals - we will not force you to eat at the hotel buffet in Thailand! I have spent over a year travelling through Thailand in the '90s and have returned many times since I know Thailand and I know the above is a great package. In fact we just a had a family return from that trip and they called as soon as they arrived home to rave about the wonderful experience and original holiday they had. So if you'r looking for that great holiday with a genuine experience of a country check us out at Travel Light you may just be insired. Rough Guides 25 Islands at R25 it's a bargain! Make the most of your time on earth! Whether you're planning the trip of a lifetime, dreaming about going, or have already booked, check out Rough Guides selection of the 25 ultimate island experiences not to see where you could be going but to see where you should be going - from Key West and Sicily to Zanzibar, Iceland and Pulau Tioman. Covering well known and off-the-beaten track experiences, this book gives you 25 reasons to grab your passport, stop what you are doing and go. Lucky means many things to many people. I have never won a large sum of money in fact I never won anything really. I have a nice place to stay and enough to eat but I work for that so I’m not sure how much it has to do with luck. I find more red lights than green and I never get away with anything that is even slightly naughty. But I am a lucky man. I have worked in small group adventure travel for 10 years now I have experienced many countries and sights, made real friends and learnt a great deal. Travel makes me happy and a happy man is a lucky man. Small group adventures is a fast growing sector of the travel industry, some say the fastest, but it's a style of travel that has many misconceptions. Unlike other styles of travel such as cruising, or a beach resort the words small group adventure is quite cloudy for travellers and travel agents alike. So what I want to do, as simply as I can, is clarify what small group adventure is all about. Adventure is the word that starts to confuse us because adventure means different things to different travellers. Think of this type of adventure as a genuine experience of a country and it’s people. So if we are having an adventure in Tuscany, for example, we would stay in a beautiful Tuscan farmhouse, meet Tuscans in a local restaurant eating great Tuscan food. Now if we were having a genuine experience in say Papua we will be trekking through thick jungle, staying in a remote village house and the food, well, it will be local. Escorted tours in small groups. The words group or escorted tour can conjure up visions of name badges, flag waving guides and one hour toilet stops. Small groups average 12 people of many nationalities from different backgrounds and all ages. Small groups mean more attention from guides and leaders and a lot more freedom. For most it is a relaxed way to travel that gives you freedom and expert local knowledge but takes the hassles of day to day travelling away. The average age of one of our travellers is 18 to 70. Travellers are attracted to different destinations, level of budget and comfort. This determines what type of person travels on which trip. Generally the group you are travelling with will have chosen that trip for the same reasons as you. Will they be the same age as you? Maybe but you will find you will have a lot in common. Small groups do not need to book big hotels. Your budget determines the facilities of your place to stay but not the comfort. People travelling on a budget will be staying in basic but clean, comfortable and central accommodation. You can afford something a little more then stay with a Maharajah in his palace or in a family run 4 star boutique hotel. You can afford the best then we will find you the best hotels hand picked for their uniqness. The only time you can have more fun being responsible than not being responsible is travelling. Giving back to people who welcome you to their country is a responsible thing to do. How can we do this? We can use operators that take us to eat in a good local restaurants, that use family run hotels, that use local businesses to help run their trips, we could buy some souvenirs from the markets or visit some sight that is away from the crowds. We could also use operators that have different community projects help those that need help the most. We can even get involved in those projects by donations or spending a couple of days helping out on a volunteer holiday. This, I hope, clears some of the haze surrounding small group adventures. There are many other questions to be answered I’m sure so you can contact me on the address below.